We, Sun Packaging System., with "Sun Flex" brand name are offering a huge range of packaging machines that are suited to pack various product such as Snack food, milk, mineral water, soft drinks, dry fruits, namkeen, seeds, edible oil and othrs. We, Sun Packaging System.,with "Sun Flex" brand name are offering a huge range of packaging machines that are suited to pack various product such as Snack food,milk,mineral water,soft drinks,dry fruits,namkeen,seeds,edible oil and othrs. 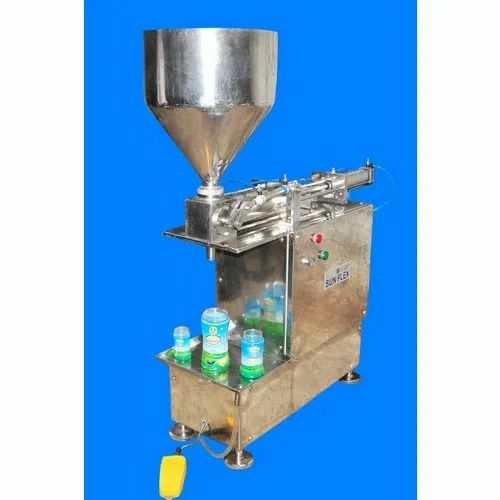 Sun Flex Paste filling machine is vertically operated automaticpacking machine consists of latest PLC Program.this liquid packing machine can pack 50 Gm to 200 Gm polythene pillow pouches.our is packing can be used to pack free flow granules,kirana items,tooth paste,grind dosa paste,ginger garlic paste, powders,inj pillow pouches injection systems for filling purpose.our is a high speed packing machine and it delivers 1800 to 2400 pouches per hour(depending on product) with an accurency of + r - 5gm. Sun Flex paste filling machine usi9ng the latest continuous sealing systems to get accurate and proper sealing we are using branded induction motors and gear boxes.our is stainless steel cabinet and all ourf products contact parts up of ASI304 food grade stainless steel.our is a high speed packing machine and it given more products less leakage percent our is totally mechanical we will take care of "after sales services"also we supplied vizag,vijayawada,nellore,bengalore,chennai,salem,nanded,warangal,solapur ,guntur etc.our paste filline machinbe is running smoothly.